If you’re looking for new and engaging art products for your children, complete with friendly characters they’ll recognize and adore, then look no further than Canson Inc. The 453-year-old fine art paper company, recently launched a new eco-Friendly line of art products for kids, featuring the illustrations of renowned artist Eric Carle such as The Very Hungry Caterpillar, The Mixed up Chameleon, Panda Bear, The Very Quiet Cricket, Brown Bear and The Very Lonely Firefly — all printed with soy-based inks. 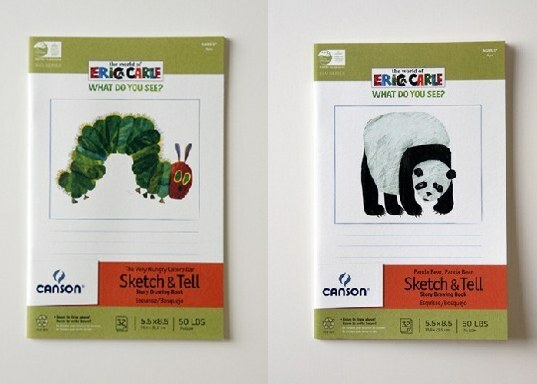 The environmentally-friendly product range of adorable drawing, marker, painting and doodle pads and Sketch-and-Tell pads is made with recycled paper from sustainable forests. Best of all, each of these notebooks will please your kids for about $5 or less. If you're looking for new and engaging art products for your children, complete with friendly characters they'll recognize and adore, then look no further than Canson Inc. The 453-year-old fine art paper company, recently launched a new eco-Friendly line of art products for kids, featuring the illustrations of renowned artist Eric Carle such as The Very Hungry Caterpillar, The Mixed up Chameleon, Panda Bear, The Very Quiet Cricket, Brown Bear and The Very Lonely Firefly -- all printed with soy-based inks. The environmentally-friendly product range of adorable drawing, marker, painting and doodle pads and Sketch-and-Tell pads is made with recycled paper from sustainable forests. Best of all, each of these notebooks will please your kids for about $5 or less.